With nearly 10,000 residents, Sturgeon Bay is the county seat and gateway to the popular Door County tourism region of northeastern Wisconsin. Since the advent of the automobile, tourists have flocked from Milwaukee, Chicago, and other midwestern cities to Door County for a beautiful, relaxing vacation. For those who don’t know, Door County is Wisconsin’s “thumb” – a long peninsula of hilly land with Green Bay on one side and Lake Michigan on the other. 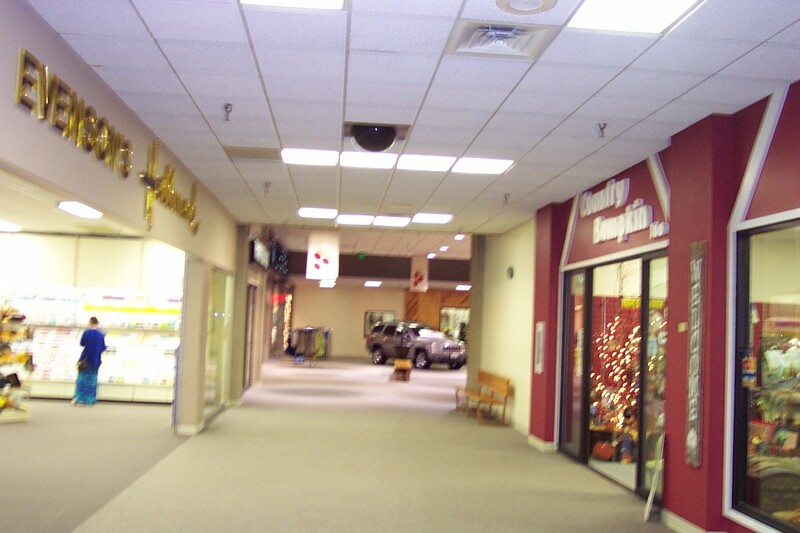 The Cherry Point Mall is a small, enclosed two-anchor L-shaped center which we like to refer to as a “sMall” here at Labelscar.com. Because it’s pretty small, right? It’s very typical of an “up-north” mall, common throughout more sparsely populated areas of northern Michigan, Wisconsin, and Minnesota, and also very similar to many small enclosed malls in relatively isolated cities across rural America in general. Anyway, the mall is decently old; I’d guess it opened around 1980. It opened anchored by a Schultz’s Family Store location which was acquired in 1989 by Prange Way, a discount department store based in Sheboygan. Prange Way closed in 1997 with the foreclosure of the entire chain, and was eventually replaced by Dunhams Sports which is still open today. 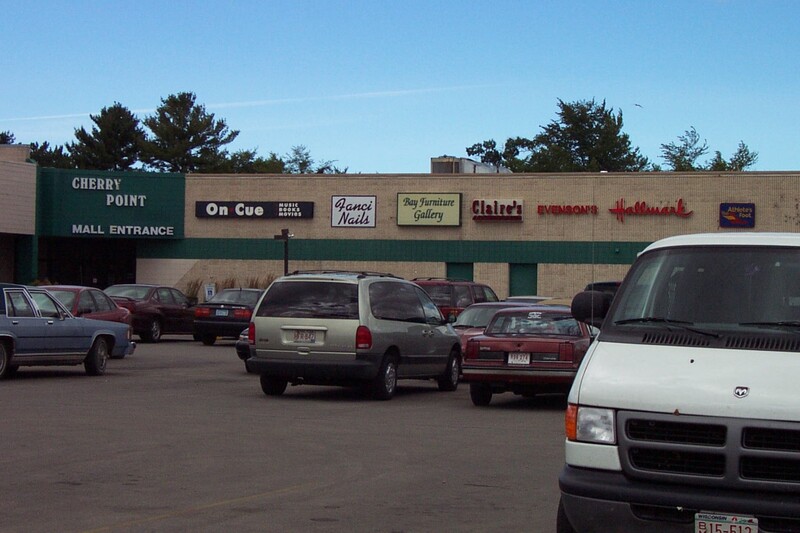 The other anchor, which was a Family Dollar from 2002-2006, was very recently replaced with Dollar Tree in June 2007. The decor of the small L-shaped Cherry Point Mall is relatively dated. The entire mall is carpeted with a beige berber, and many of the stores inside have wooden facades. Also of interest were the hanging banners from the ceiling with the mall’s name and logo, a throwback to the past and a commonplace in these little up-north sMalls. In addition, the store roster is typical of rural sMalls as well, with a much higher prevalence of local retailers rather than national chains, with the exception of the anchors. Also typical of an up-north sMall are the placement of the ubiquitous Hallmark and the numerous craft stores; one here is named Country Bumpkin, I think that’s all we need to say? The pictures featured with this post were taken in July 2001. Leave us some comments and let us know how the mall has changed in the past six years, or any other information you have – such as, when the mall opened and what the Family Dollar/Dollar Tree anchor has been over time. The place looks cozy…almost homey. In a cold place like that with probably not much retail, it doesn’t surprise me the mall remains largely full and successful despite the fact it has very low-key decor and narrow hallways that look more like a middle school than a shopping center. I think if it had brown tiles from the era it was built instead of carpet it would feel a bit more like a shopping center. You could have said this was any random mall in any random Canadian town of 5000 people, and you would have fooled me. I swear between around 1975 and 1985, there were a bazillion malls built across Canada that look pretty much like this. All that’s missing is the grocery store. Those things have character though….unlike the renovated-many-times-over behemoths in the bigger cities. This is just a total guess, but maybe the Family Dollar was Spurgeon’s? @Bobby, You’re almost right on. Spurgeon’s was the actual “other” anchor at the end of the enclosed mall. That area is now just a collection of small service-type shops. 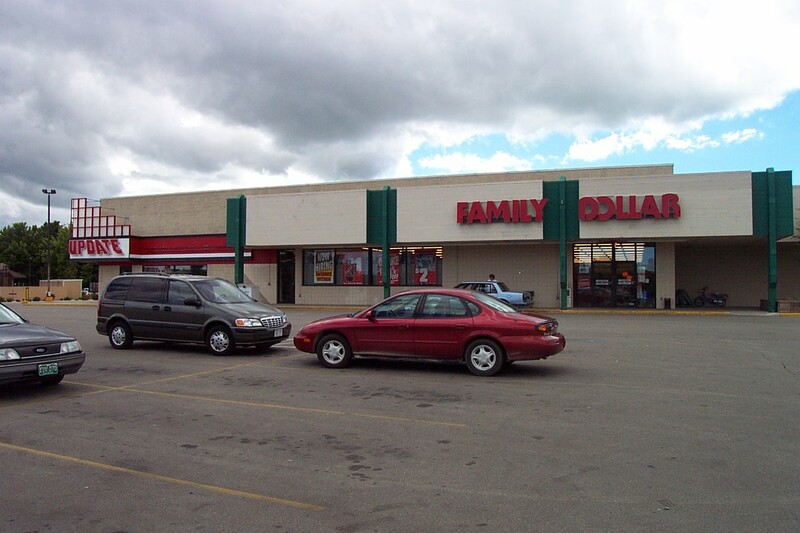 Where Family Dollar is now, (in the open portion of the mall,) started out as the Piggly Wiggly grocery. Inbetween those two was another “anchor,” the J.C. Penny’s hard-goods store. So in its heyday, little CPM boasted three different department stores. Actually that should be “Schultz’s” (not Schmidt’s) Family Store, and they had several locations in Wisconsin. Small family-owned chain I think. All taken over by Prange Way in 1989 as you had down. These made for some of P-Way’s smallest stores in terms of square-footage. It’s nice to see such an old-looking ‘sMall’ being, for the most part, fully occupied. Very sharp contrast to my Edgewater Mall entry from a few months back. Both malls are close to the same size. Late 1970s opening seems like a fair guess…I’m not sure myself either. I’m just going by the styling of the interior….narrower hallways, the ‘dark’ colors, the dim lighting. It’s just missing the familiar brown/terra-cotta styled tiling for the floors for the complete look. I’m suprised they substituted it for carpeting. That’s something you rarely found in malls built back in the late 1970s. Most of Sturgeon Bay’s retail growth now is around the city’s southside. Cherry Point is at the north side of town. Downtown still boasts a Younkers. A little addendum to my initial comments, now that I had more time to dig through the linked articles. In the article you linked to (the one announcing Dollar Tree’s opening at the mall), Prangeway, it mentions that Piggly Wiggly was once in the spot Dollar Tree now occupies. So the tenant changeover would be this. So there’s another name to throw into that space. On Cue would obviously be gone now. 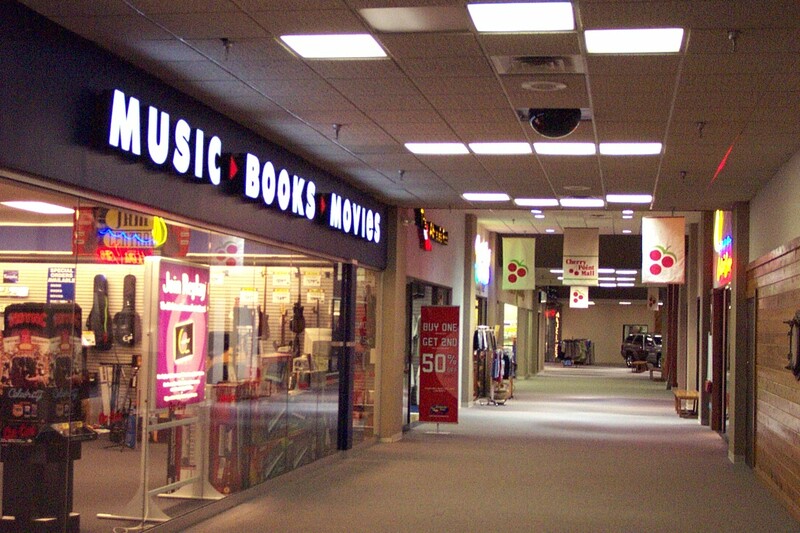 It probably didn’t even survive the Sam Goody re-branding (in 2002) during Best Buy’s failed ownership of the Musicland group. @Matt from WI, On Cue is now home to a branch of the Wisconsin JOB Center. I love malls this size! I just want to buy it and expand it. Put in some skylights and get rid of the false ceiling. Perhaps even put in a large center court to host local events. It’s a diamond in the rough! I remeber this mall growing up in SB. The main place I used to go to was the Loose Change Arcade right in the middle of the mall. I also worked at the Piggly Wiggly Bakery Dept up until they closed. A good friend of mine also owed a comic book store (Hidden Treasures) on the corner store where Claires ended up. I have great memories growing up here when the mall opened. It really has gone thru a slew of changes. Yes — there originally was a Spurgeon’s. There was also a Hurrah and another women’s clothing store next store to it when it first opened. At various times, there was a Reiser & Lee Jewelers (based out of Green Bay, I think) and a Deb shop — which became Maurice’s. There was also a hardware store (I think it was a Coast To Coast). The barber shop that is still there is called Cutter’s Cove. It was The Barbers when the mall first opened. I remember in the first few months of the opening, you could barely make your way through the hallways from store to store. It was swamped. Funny thing — I don’t remember any eateries — except the McDonald’s on the south end of the parking lot. There was a small cafe in at one time, too, but that was well after the mall jumped the shark — and it was never very popular. The arcade, however, was a huge draw! I just recently went to this mall, snapped a few pics, and saw how really “condensed” this mall got. I was at Dunhams and saw the opening that used to go into the mall, that is all walled off. 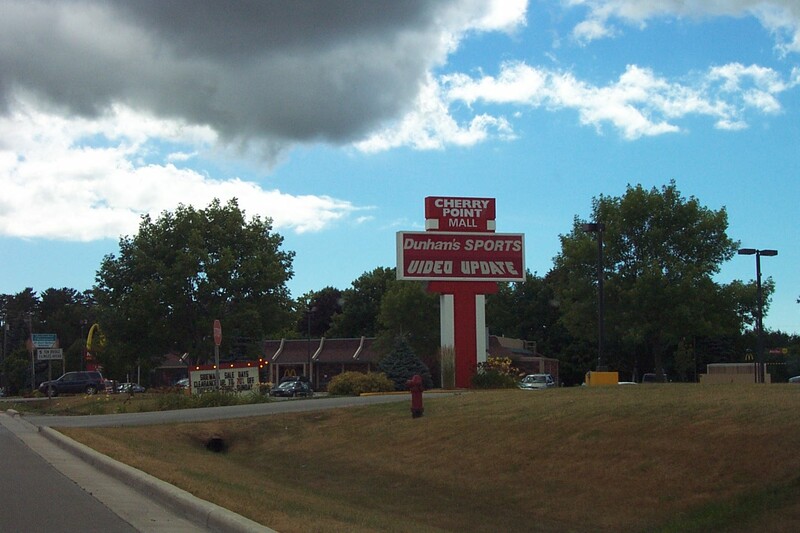 I also grew up in sturgeon bay…though i missed out on the arcade :(, but i do remember reting videos at the place that is now a chinnese buffet place, and i remember spending much money at teh on cue that is now an employment place…..ahhh great memories. Yeah, I just looked at the 3-d aerials at Live Maps (they’ve been updated). Sure enough, 1/3 of the original enclosed mall…starting right were the Spurgeons / Schultz’s / Prange Way / Dunhams anchor is / enters into the mall, going about 1/3 of the way west, has now been ‘big boxed’. Who occupies it, I can’t tell…..can’t read the exterior sign above what was one of the mall’s two entrances. Good thing you guys got in this place when you did. I’d like to see those updated images also, whomever has them. If nothing else, throw open a Flickr account and toss them into the folder for this site / group. I have lived in Sturgeon Bay my whole life, and remember the Piggly Wiggly where the Dollar Tree and Hong Kong Buffet are, I think the Piggly Wiggly went out of business in about 1991 or so. Then there was a Lifetime Video (I think) and then Video Update in the space used by the Hong Kong Buffet. Coast to Coast was next to Bay Pharmacy. The Spurgeons also had a hair salon upstairs, now it is just an empty area there. I believe there was a JC Penney where the OnCue/Sam Goody used to be, and I also remember a pet store, which I belive was called Pet Corral, near the Cutter’s Cove. Now Paragon is in the space formerly occupied by the east enterance. Dunhams is still there but there is no access to the mall as there used to be. The only stores in there now are a sprint, Cutter’s Cove, Eyes for You, Advance America, and Fanci Nails. When it opened, the 2 anchors were Shultzs and a grocery store called piggly wiggly. Shultzs (and later prange way) occupied the area wher both dunhams and wall to wall are now. Piggly wiggly took up the space now occupied by hongkong buffet, dollar tree, and outpatient services. 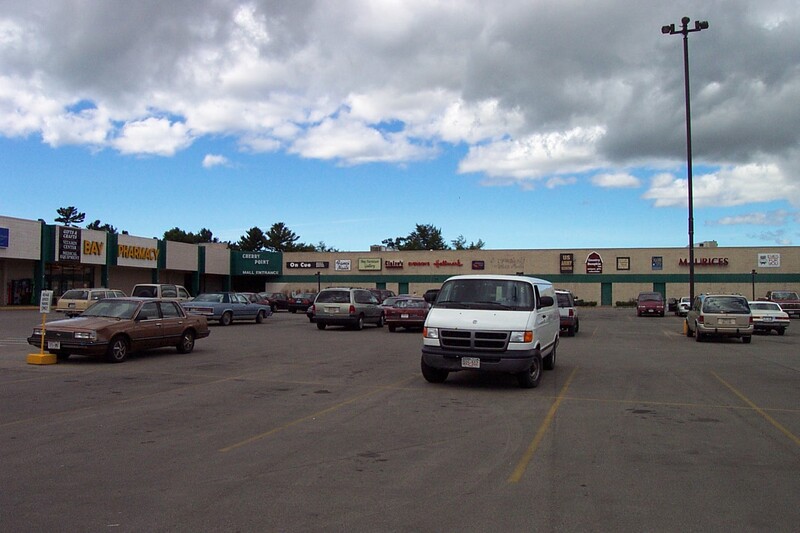 There was also a coast to coast store – which bay pharmacy expanded into, Foot locker, maurices, a jewelery store, a comic and card shop called hidden treasures, and spurgens. Spurgens was located at bend of the “L” opposite from shultzs. I was at this mall a couple days ago, and there’s not much left of the interior. It looks as if it is going the way of Green Bay Plaza in Green Bay, Wisconsin. 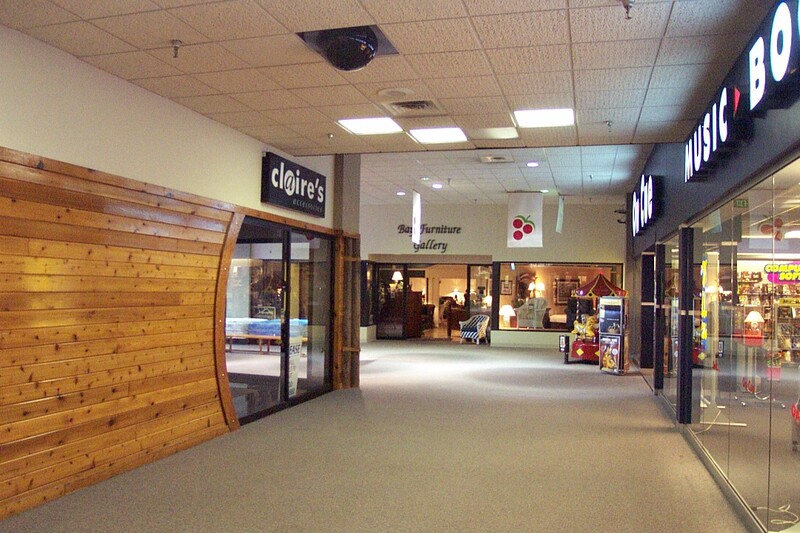 The remaining portion of the mall’s interior serves as nothing more, than a portal to the Wisconsin Job Center (former OnCue), a payday loans business (former Claire’s), an eye care place, a gift shop, and some bathrooms. The rest is just open-air tenants with some vacancies. This mall isn’t what it used to be. You have me interested on GB Plaza. I had a sneaking feeling that during the mid/late 1970s, they made a slice of that strip shopping center into an enclosed area. Of course, today it’s come full circle, reverting to just a strip of big boxes and smaller shops once again, just how it started. The same thing seemed to happen at a lot of the larger strip-type malls….parts (or a majority) of them going enclosed, during that period. I grew up in Sturgeon Bay as well. As kids we laughingly called it the “Cherry Point Hall”, as anybody with half an ounce of cool hung out at Port Plaza in Green Bay. The mall opened around 1980 and was anchored by Spurgeons and Schultz’s Family Store. Piggly Wiggly was a detached building at the time. 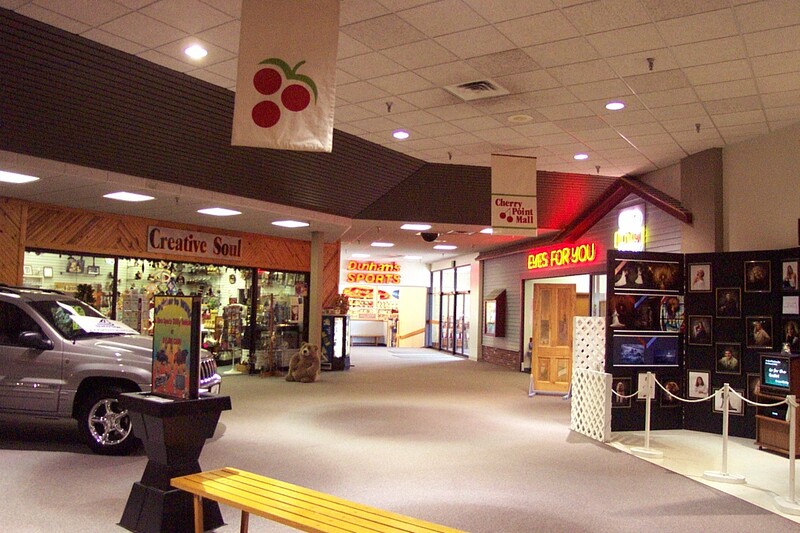 Interestingly, the mall was home to two arcades: Pocket Change and The Upper Dog. At one point, the competition between the two led to outrageous sales of 20 tokens for a dollar. Upper Dog went under soon thereafter and Pocket Change eventually morphed into Loose Change. The early 80s saw rapid growth of the mall, with the addition of Bay Pharmacy, Coast to Coast hardware, and JC Penney. This construction filled in the empty space between Piggly Wiggly and Spurgeons and gave the mall it’s ‘L’ shape. All of these shops had external entrances and could not be accessed from within the mall. Outside of the aforementioned stores, the Cherry Point also was home to The Barbers (a hairstyling salon), The Shoe Rack, a Hallmark store, Deb, and another apparel store — perhaps Hurrah. 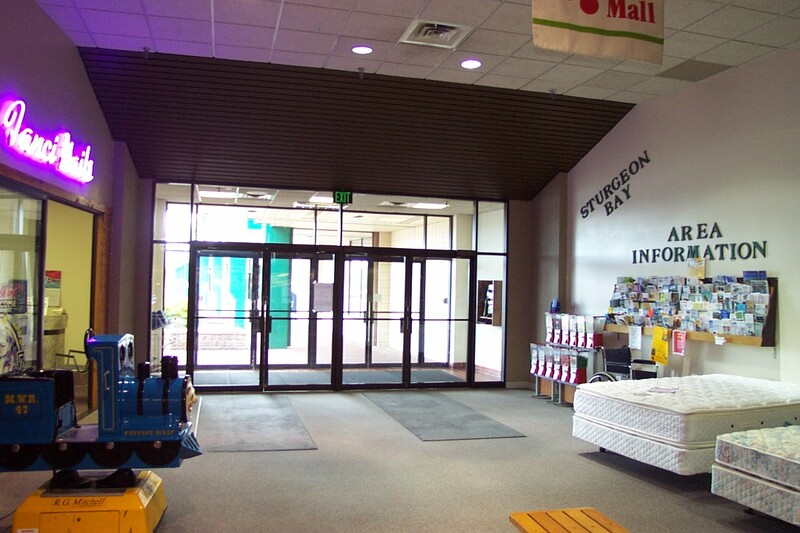 I visited Sturgeon Bay and the Cherry Point Mall in 1998 on a trip from England. I got 2 items @ $7.99 each- question is, what was I buying? Could it have been cd’s?